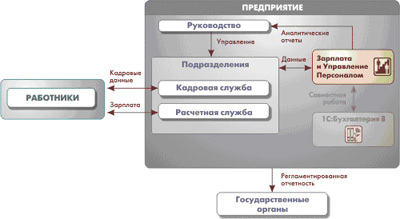 The configuration 1С:Payroll & HR Management is used to automate the processes of recruitment, the human resource management of an enterprise or holding company and calculation of payroll. It is successfully applied in the accounting department and HR function, and also in other subdivisions tasked with the organisation of the effective work of staff. employee competence, training and certification management. The system makes it possible to keep accounts in a unified database on behalf of several organisations (legal entities) that constitute a single enterprise from the perspective of the organisation of the actual business. The configuration ensures parallel management accounts and statutory accounting. Management accounts are kept for the enterprise as a whole, and statutory accounting separately for each organisation. If this configuration is used at an enterprise, the submission of statutory reporting to the state authorities will become a far less labour-intensive process. This concerns in particular the data for the personified accounting of the Pension Fund (SZV-4, ADV-11) and reporting on personal income tax (2-NDFL). Management gains full control over developments, sets the enterprise structure and component organisations, analyses the personnel structure and takes management decisions based on full and reliable information. Powerful analytical reports provide the user with information in random breakdowns. The HR function receives a valuable tool for automating routine tasks, including the compilation of questionnaires and preparation of reports on employees, using different selection and classification criteria. The enterprise’s employees gain assurance that they will be able at any time to rapidly receive the statements that they require, information on their vacation and personified accounting data with the Pension Fund, etc.